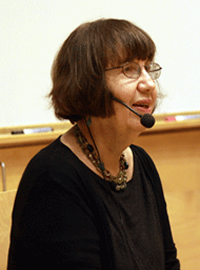 Nina Glick-Schiller is the Director of the Cosmopolitan Cultures Institute at the University of Manchester. She was zormerly Professor of Anthropology at University of New Hampshire. Her most recent book projects develop migration theory by examining the relationship between the migrant and the city. These books contest the methodological nationalism of most migration studies that remain fixed within the comparative framework of individual nation-states and state policies. The first book, Locating Migration: The Migrant and the Scale (forthcoming), co-edited with Ayse Caglar, examines the relationship between the scalar positioning of cities and the pathways of migrant. The second book, Pathways: Placing Migration Theory, argues that the entire debate about immigration, assimilation, multiculturalism, transnationalism, and citizenship has very little to do with how migrants actually live their lives. Her current research documents the experiential cosmopolitanism that of accompanies migrants transformations of urban life. At MPI-MMG Prof. Glick-Schiller will be working across departments to develop joint projects on cosmopolitan cities.